West Texas ranchers are broadening their income streams to keep their cattle operations afloat. Around 76 percent of land in Texas is ranch and farmland and nearly all of it is family-owned. Over time, ranching has changed; nowadays, it is often no longer possible for ranchers and farmers to meet the costs of maintaining their land and business solely through agricultural income. To make ends meet, farmers and ranchers are broadening their income streams, incorporating hunting and ecotourism into their operations, using their resources to host guests and out-of-towners looking to experience the Texas landscape. On the CE Miller Ranch, just outside of Valentine in Far West Texas, the Millers are one such family getting creative with their resources. Jody Miller, the family matriarch, recounts the stories of the ranch as a cat chews on some mail at her feet. She was raised in Tulsa, OK, a self-proclaimed “city girl,” and had no idea what ranch life was like until she met her late husband, Clay Miller. Jody and Clay married in 1949 and Jody has lived on the ranch ever since. The walls, tables and even windowsills of the house are blanketed with family photos and awards won for excellence in land stewardship and resource management. Jody’s life is a far cry from those early days. 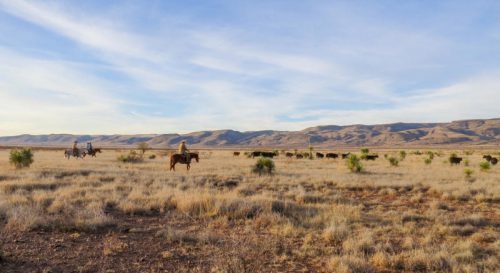 Though much has changed on the ranch, one thing certainly hasn’t: It’s no easy task to ranch in the West Texas desert. “We live in a desert, or a perpetual drought, interrupted by an occasional flood,” says Bill Miller, Jody’s son. For the past five generations, the Millers have kept a meticulous log of rain records on a large sheet of paper. Bill points out a two-year stretch when the rainfall was particularly low, a drought that spanned from 2010 to 2012. Five years later, Jill Miller, Bill’s wife, says the family is still trying to bounce back. “You have less cows, and of course you have less grass, and so, in order to keep your land in some kind of shape so it can come back, you start selling cattle,” Jill says. The CE Miller Ranch can support 500 cattle, but during the drought, the Millers’ herd dropped to 75 cows. Left with only a fragment of their original herd, the Millers had to find new ways to combat rising costs while still maintaining their cattle operation. Ryan O’Shaughnessy, a professor of agricultural business at Sul Ross State University, says this is very common. Six hours east of Valentine lives David Langford, who wears both of those hats. Langford is the former CEO of the Texas Wildlife Association and currently operates a portion of his family’s ranch outside of San Antonio. Langford’s relatives have worked that land for seven generations. But back in mid-90s, selling that beef wasn’t paying the bills, and Langford wanted other options. In 1997, Langford helped put together a statute with the Texas Legislature that made it easier for ranchers to open their land to nature-related tourism: hiking, hunting, camping, fishing, photography and more. Capping someone’s liability lessened insurance premiums, opening more people to the idea of ecotourism. “From 1997 to now, it has expanded into basically helping hold ranches together and heritage together because just about anything you can think of that happens in the outdoors can now be accomplished on private lands,” Langford says. Langford estimates that today, 20 to 40 percent of a ranch’s income comes from hunting and other nature-related tourism. This is true for the Millers, who say almost a third of their income now comes from hunting tours. Hunts on their property can cost up to $4,000. Other ranches charge up to $8,000, but O’Shaunessey says even if a ranch sells six to seven hunts a year, bringing in $30,000-$35,000 more, that money is just making ends meet. Not everyone is interested in ecotourism, however, as they are still anxious about liability or don’t want the extra people on their land. The Millers say the biggest threat to ranching is that not everyone who has a stake in the ranch is on the same page. Bill Miller estimates there are 30 or more heirs to his family ranch, and some of them are not interested in investing in ecotourism. But for some, fooling with them is the only option. Langford says ranchers often get a bad rep as “big bad land barons,” but insists that’s the opposite of the truth. This entry was posted in KRTS News, KXWT News and tagged eco-tourism, Farming, Ranching, West Texas. Bookmark the permalink.